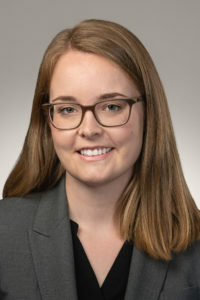 Margaret Davis joined Davis Grimm Payne & Marra as an associate in 2017. She represents employers in a variety of labor and employment disputes and litigation. Ms. Davis has experience in matters regarding the Americans with Disabilities Act (ADA), the Family and Medical Leave Act (FMLA), wage and hour laws, wrongful termination, discrimination, and retaliation. Ms. Davis enjoys advising clients on preventative employment practices and working with management to develop policies in compliance with federal, state, and local law. Prior to joining Davis Grimm Payne & Marra, Ms. Davis practiced law in Chicago, Illinois at the law firm of Klein Thorpe & Jenkins, where she represented public sector clients in a variety of matters including employment litigation and property zoning and development. She has a bachelor’s degree from the University of Michigan and a juris doctor from Loyola University Chicago School of Law. She is an active member of the King County and Washington State Bar Associations.